Flossing teeth after brushing is putting the final touch on a health routine that’s designed to keep away tooth decay and gum disease. Because it takes a little more effort than brushing, it’s often ignored when one is trying to get out the door in the morning or too tired to wrangle with dental floss before bedtime. But flossing achieves what a toothbrush cannot and may result in fewer trips to the dentist office. It gets rid of tiny bits of food and bacteria that the brush doesn’t reach, and by removing them, also carries away plaque that could otherwise build up and cause tooth decay. Keeping the gums free of bacteria also prevents gingivitis, the most common form of gum disease. 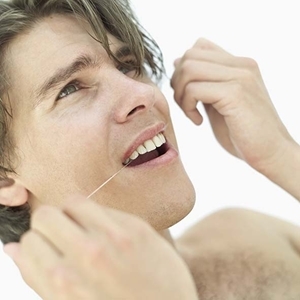 Dentists recommend flossing at least once – and preferably twice – each day. It’s important to get slightly under the gumline by gently curving the floss around the bottom of each tooth, then slide the dental floss up and down between the teeth to fight plaque build-up there as well. About 18 inches of dental floss will allow one to wind the floss well around fingers on each hand and create the tautness needed to maneuver around each tooth. Multifilament or monofilament? Those are the two types of floss, and each has its advantages. Nylon (multifilament) floss comes in different flavors and is available in unwaxed or waxed versions, which some people find allows it to slip more easily between the teeth. Waxed floss works better between teeth with fillings or crowns. However, it’s more likely to shred at close contact points when the separate nylon strands may separate. PTFE (monofilament) slides most easily and doesn’t shred. For this convenience, it’s a little more expensive. There are also wide-sized flosses available for people who have a lot of dental bridges or wide spaces between each tooth. An alternative is to use flossers, which are disposable flossing tools that hold a short strand taut within the tool, which resembles a tiny saw. A small handle allows one to slide the floss easily between teeth and maneuver into tight spots. People with limited dexterity or arthritis may find flossers easier to use, according to KnowYourTeeth.com. While not as effective as flossing, water picks also remove food particles by loosening them with a stream of water aimed at spaces between teeth. While they won’t remove plaque, they help people with orthodontic braces clean out the food bits that become lodged in their teeth.